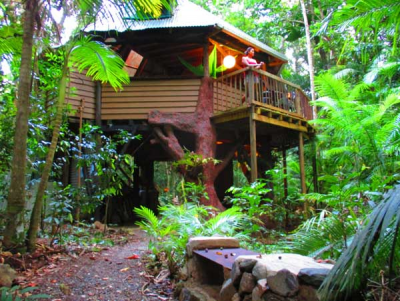 The Daintree Jungle Treehouse is true jungle style accommodation located deep inside the magical ancient Daintree rain forest, perfect for the adventurous traveller who wants to experience the real Daintree. This place is located within walkiing distance of the rain forest village of Cape Tribulation, beaches, National Park boardwalk, restaurants, shop, etc. Designed and built as an octagon shaped treehouse, set three metres high to enjoy magnificent views of the dense surrounding rain forest, 150 metres from the nearest neighbour, and right next to a beautiful creek with a swimming hole. This unique accommodation features a (composting) toilet with rain forest views, an outdoor (hot) shower, solar electricity, a queen size bed, an east facing breakfast bar, a small gas fridge, a basic kitchen, and a wood fired barbeque. An open design ensures natural ventilation and great jungle views, while roll down screens can keep out the rain which is a part of life in the rain forest. At nearby Rainforest Hideaway we can arrange all your tours and activities and you can use free Wifi. Contrary to what you would expect, there are no mosquitoes at night! 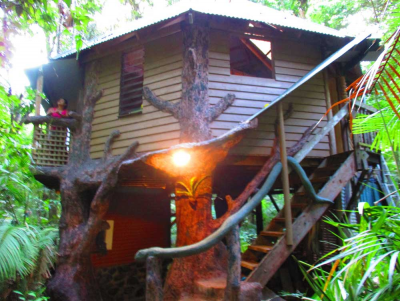 The Jungle Treehouse can accommodate up to a maximum of three persons. The single beds are only made when needed, so if you require a twin configuration please let us know in advance, a $15 charge applies per extra single bed. The Jungle Treehouse is an open design jungle accommodation, only people with a sense of adventure who like the outdoors should book this. We do not accept bookings with children less than five years old, and people that are elderly or have less mobility should consider if this is suitable for them as the only access is via a jungle trail and there are stairs to climb. Cancellations up to 7 days before arrival: no charge, or refund if already paid, but $10 administration fee retained. Cancellations less than 4 days before arrival: full amount charged. If we can re-book the room a 90% refund can be made. For stays longer than four days stricter conditions may apply as it will be harder to re-book the house at short notice. The above cancellation times are calculated from 12 noon which is check-in time. For bookings longer than four days stricter conditions may apply as it will be hard for us to re-book the room at short notice if a long period is cancelled. Perfect accommodation for the adventurous traveller who likes just a bit more luxury than camping in a tent. This treehouse has a queensize bed in the main living area, but also a single mattress upstairs in the loft. Other features include a basic kitchen, gas stove, small gas fridge, open air hot shower, composting toilet, nearby swimming hole in the creek and a wood fired BBQ. No availability in this one? See our other accommodation.